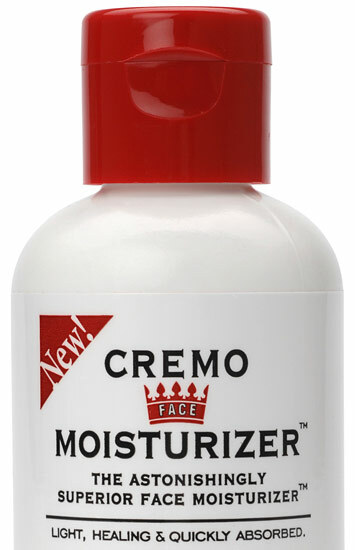 The new Cremo moisturizer ($9), by the folks behind the buzzed-about Cremo shave cream, is a lightweight lotion that provides 24-hour moisture and visibly improves skin. Plus, it's affordable and available at your local CVS or Walgreen's. First impressions? The stuff is easy to work with. Squeeze out an almond-size dollop of the cream, rub it between your palms and it instantly melts into a gel that smoothes over your face easily. It takes just a moment, but once the moisturizer absorbs, there is no sticky residue or greasy shine. What's more, there are no dyes or fragrances to irritate your skin or clash with your cologne. This really feels like you don't have anything on at all. At the risk of sounding like an infomercial, your face feels clean and refreshed. There's no stinging sensation, even after shaving. And after a few days, we noticed a reduction in redness and irritation, probably due to natural anti-inflammatory ingredients like mugwort and aloe. In short: this is our new go-to moisturizer. And at this price, feel free to slather it on every day. The only drawback? There's no SPF, which isn't exactly a dealbreaker. The Cremo brand is developed by a former model and the engineer who invented the dry erase board.